Move your style forward with the sleek and sophisticated 2016 Mazda3 in Springfield, Missouri. This year, every Mazda3 comes equipped with a rearview camera, while Sport trims and up get automatic wipers and automatic headlights, as well as a sunroof as standard equipment. 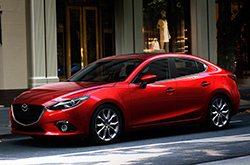 Other changes include the discontinuation the Mazda3 s Touring style is no longer offered with a manual transmission. Read our full 2016 Mazda3 review below to learn more about this sporty car. 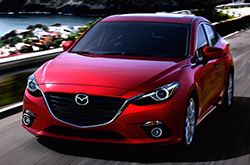 Offered in four-door and hatchback body styles, the Mazda3 is packed with fun features and world-class technologies. Starting with features, the entry-level four-door Mazda3 i Sport gets a convenient 7-inch touchscreen display, cruise control, a tilt-and-telescoping steering wheel, power-folding mirrors, stylish 16-inch wheels and a 60/40-split folding rear seat. Plus, you can relax or rock out to your favorite tunes with the six-speaker audio system with a USB port, auxiliary input, HD radio and smartphone-enabled Internet radio. Get all these features and up the enhancements with the available Preferred Equipment package; 16-inch wheels, heated side mirrors, a rear seat armrest, premium cloth upholstery and more. On the safety front, the Mazda3 i Sport comes with rear cross-traffic alerts and blind-spot monitoring systems that are only offered on the four-door body styles. For even more luxury and amenity, count on the Mazda3 i Touring trim levels and above to deliver. Powered by a 2.0L four-cylinder engine that generates 155 horsepower and 150 pound-feet of torque, the Mazda3 offers a dynamic gallop, while it's lean design makes parking and maneuverability easy. Switching gears to talk about what's under the hood, the Mazda3 in Springfield, Missouri is offered in either a six-speed automatic or manual transmission, with the latter coming standard on all Mazda3 s GT trims. If you're not a fan of a stick-shift transmission, the Mazda3 s GT does offer an available automatic, as well. Scroll down and check out the 2016 Mazda3 review video for more details. When you're done, please visit or call us to schedule your test drive today! We're absolutely sure that the Mazda3 is ideally suited for you. 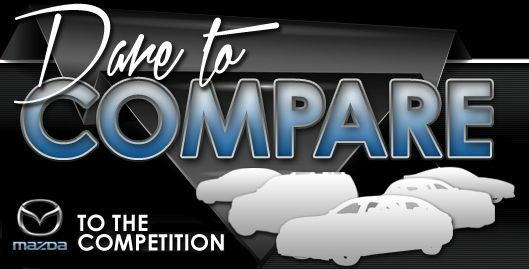 That's why we urge you to compare Mazda's most current model next to the 2016 Chevy Cruze, Hyundai Elantra and the Honda Civic. Shoppers will be pleased with the Mazda3's attractive looks, as well as its convenient incar technologies. It's a fabulous value. Just compare its price to the vehicles in its segment and you'll surely see why so many Springfield drivers love it. Find out more info about its specs in our bullet list under this paragraph! 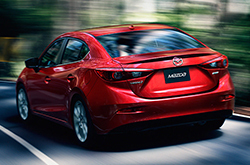 Thank you for selecting Reliable Mazda as your source for 2016 Mazda3 reviews. Experienced automotive writers performed many hours of research to write the reviews on our site. As you read this article, you'll see that it is bundled with matter-of-fact information about all the things you're looking for in the new Mazda3 - cabin features and other specs included. If the Mazda3 isn't a good choice for you, please review and compare Mazdas other attractive vehicles now.